My semi-modulars : Mother-32, DFAM, 0-Coast, System-1m. My sequencers : KeyStep, BeatStep pro, SQ-1. 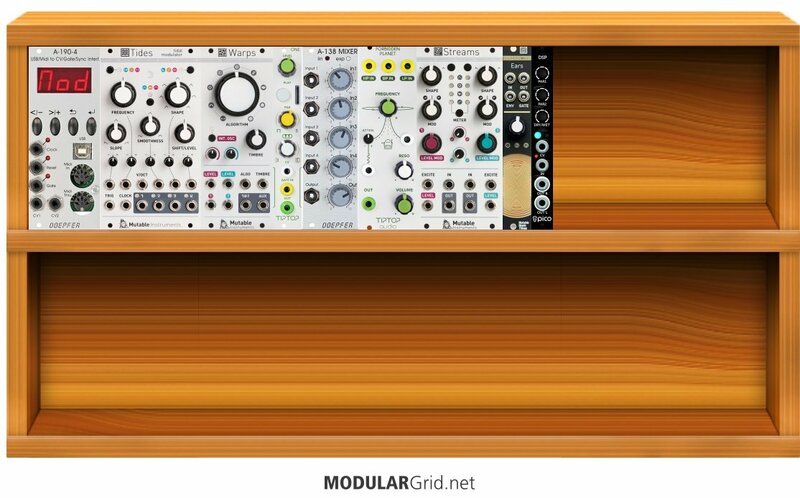 In your opinion, is this rack a good beginning to extend and complete my set, and make my first steps into the real modular world ? So far, so good. My preference for an external input module is actually the Doepfer A-119, as it gives you a better choice of external connections. 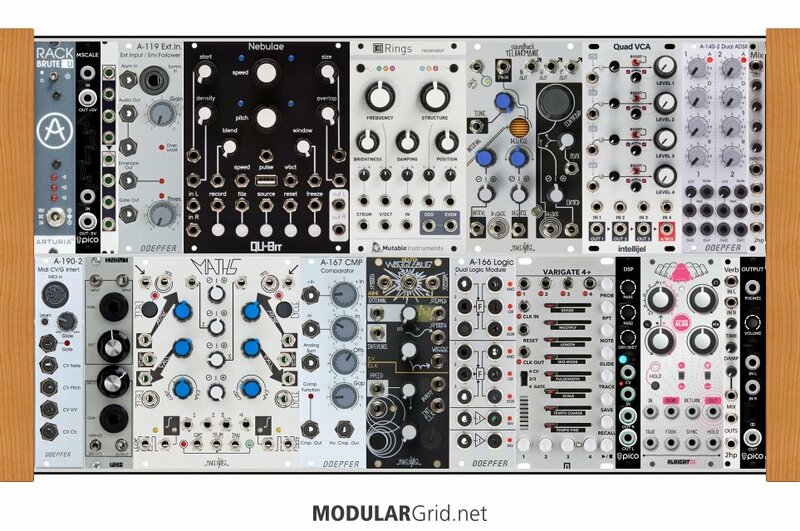 Another thing you should consider would be some modules to extend the capabilities of the sequencers, such as logic, clock modulators, divide/multipliers and so on. These will let you create some rather complex interactions between the hardware sequencers you already have. You might also double down on some basic modules here, such as VCAs, EGs and LFOs to add some modulation complexity, plus the use of linear VCAs to control/change CV/mod signal levels as needed. Last, look at getting one or two Erica PICO MScales so you can easily translate back and forth between the M32 and DFAM CVs and everything else, keeping everyone in the proper scaling. Thanks very much for your advices Lugia. 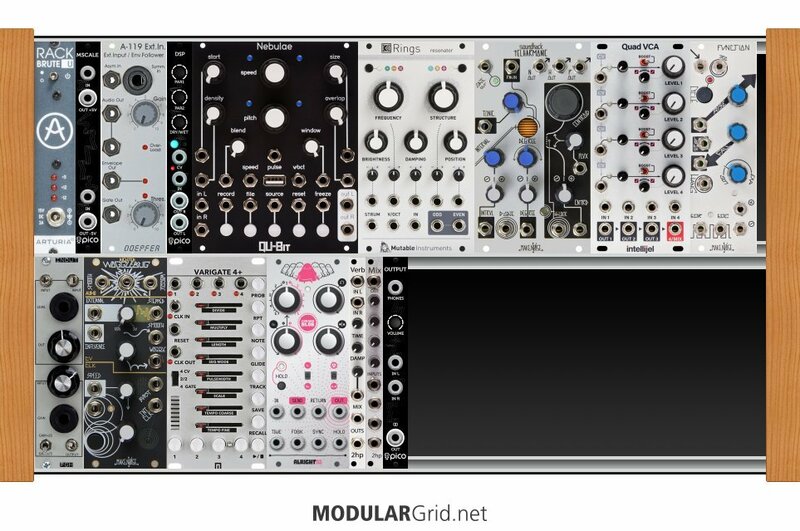 Your remarks gave me a better understanding of the way a modular can be built up. So, considering your suggestions, I modified the rack. Your final judgment would be very valuable. Yep...actually, I'm partial to version #2, but here's a few tweak ideas there: first, if the M32 can function as MIDI-CV (which should be doable with the MScales), or the 0-Coast or System 1m, you can remove the A-190-2. 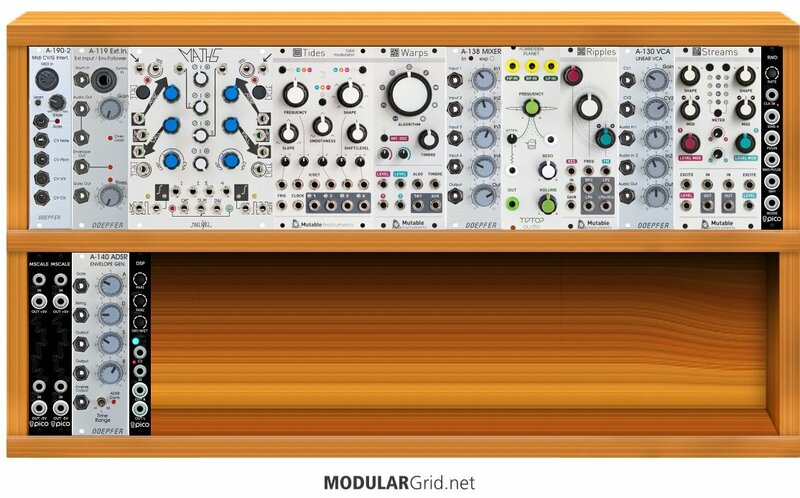 Then if you remove the A-130 as well, you have ample space for an Intellijel Quad VCA, which not only gives you four VCAs (more VCAs = good) that have sweepable response curves, you also get some mixing functionality in the bargain, and this actually costs $10 less. Plus, pull the A-140 out and replace it with a Doepfer A-140-2 which, if you select the inverse envelope jumper function, then gives you positive and negative envelopes on each ADSR's output. Almost like having four ADSRs in the space currently filled by one for about $60 more. Not a bad tradeoff. So far, so good. My preference for an external input module is actually the Doepfer A-119, as it gives you a better choice of external connections. Another thing you should consider would be some modules to extend the capabilities of the sequencers, such as logic, clock modulators, divide/multipliers and so on. I wrote about this at https://uk.edubirdie.com/do-my-assignment. These will let you create some rather complex interactions between the hardware sequencers you already have. You might also double down on some basic modules here, such as VCAs, EGs and LFOs to add some modulation complexity, plus the use of linear VCAs to control/change CV/mod signal levels as needed. Last, look at getting one or two Erica PICO MScales so you can easily translate back and forth between the M32 and DFAM CVs and everything else, keeping everyone in the proper scaling. I was going to buy Erica PICO MScales for my set. Thank you for advice. Well, well... Things are moving. A RackBrute 6U has been ordered this week. Starting from a first approach and your expert advices, then after watching some Youtube videos (as you guess... ;-) I have led with this set (to be linked with Mother-32, DFAM, 0-Coast, System-1m, KeyStep, BeatStep pro, SQ-1). My piggy bank is shaking. It would be great to read your opinion. It's getting there, yep...I still think the Maths would be preferable to just the single VC Slope of the Contour because of all of the internal routings you can do with it to reconfigure it in some very complex ways. Why not pull the Contour in favor of a Doepfer A-140-2 or an A-141-4 for some additional "proper" ADSR EGs? Also, you might consider a comparator or two, since adding those plus a Maths would give you a decent compliment of modulation sources on which you could use the comparator(s) to fire gates when the modulation curves pass given voltage points. Put this together with some logic to work with the Varigate, and you'll have lots of rhythmic mayhem possibilities. Thank you very much Lugia for taking the time to provide, from the beginning of this thread, all your detailed and expert advices. You convinced me about Maths, and I adopted your suggestions about the A-140-2, the comparator (I was totally unaware of that kind of module), and a logic to work with the Varigate. All your comments have been a valuable input for me in this phase of discovery and understanding. I'm not completely a newbie in synthesizers (I began with an Arp Axxe in the 70's...) but the modular word is a lot different, and there are so many devices and options. A last question if it doesn't bother you. 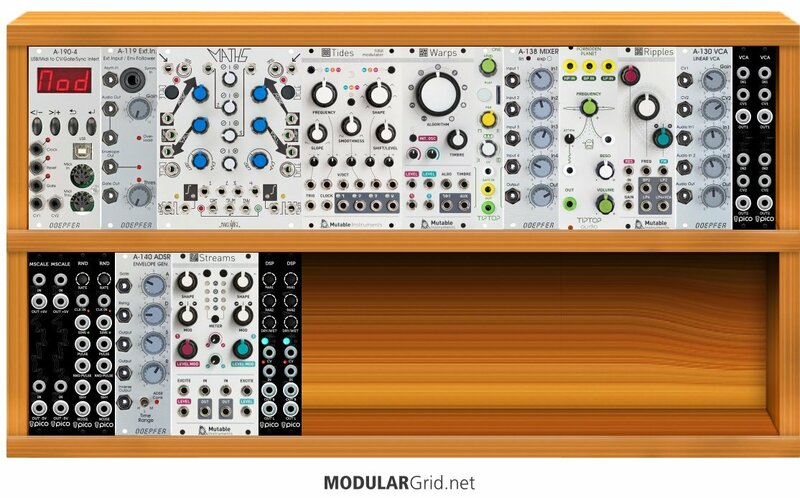 I already bought the RackBrute but I'am planning to order the modules in two steps for reasons of budget. If you have any suggestion, two lists, it will be very welcome. No list suggestions, but one technical one: try and keep things dealing with audio away from the power supply. That area is fine for modulation sources, CVs, etc, but if there's a bit of noise on your DC that creeps into the P/S, it can also sneak into the audio paths. The MScale, buffered mult, and MIDI interface are fine, but you might want a little more distance for the In/Out and the A-119, especially since both have preamps that can boost low-level audio. Otherwise, this is looking pretty damn good!